The Red/Blue Columbian Tetra gets its name from its bright red tail, and it has reflective scales that shimmer. The Red/Blue Columbian Tetra is a good community fish and is hardy enough for beginners. A beautiful fish it looks great in schools. They will readily breed at times and are a great addition to any aquarium. There's a good chance it's a Characin... if you see a freshwater fish with an adipose fin and no barbels! Characins are very large group of fish that make up the Order Characiformes. There are at least 1674 species contained in about 270 genera. A visual clue to a Characin is that it will have an adipose fin. That's the little fin on top behind the dorsal fin and just before the tail. What its purpose is remains a mystery, but many Characins except for a few genera have them. An adipose fin can also be found on several catfish types. Some other clues to identifying Characins are that, unlike catfish, they don't have any barbels. Barbels are whiskers or antennae type extensions that extend from around the mouth area of some fish. The Characins are also primarily freshwater fish and are most primarily carnivorous, eating proteins of various sorts. But many will also eat some plant matter, so are actually actually omnivores. Of those that are herbivorous Characins, some are Limnivores, ("mud-eaters" or "bio-film grazers"). These fish eat algae, microorganisms and other things growing on the rocks and substrate of their environment. Characins are generally hardy fish and many are great for the beginner. Most are schooling fish so they do better in a community aquarium with lots of buddies to hang out with. Apart from the predatory species such as the Piranhas, most are peaceful even if carnivorous. They will usually readily accept aquarium foods like flakes and tablets, as well as enjoying supplements of brine shrimp and various types of worms. They usually prefer clear, slightly acidic water with strong currents and highly oxygenated. This can be provided with a strong filter and good surface movement. The Characin species list below includes popular types, as well lesser known Characin varieties. Each fish guide has a description of the species, its place of origin, habitats and behaviors, as well as fish care to successful maintain them in an aquarium. Fish pictures are also provided within each fish guide to help with identification, and to aid in choosing the best type of Characin for your freshwater fish tank. 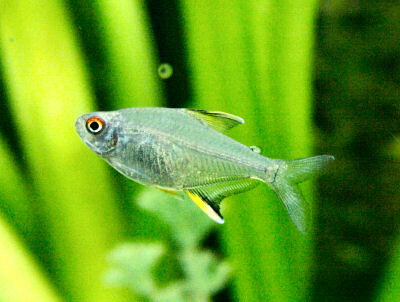 Some of the best known Characins are the brightly colored Tetra species. Yet this group has great diversity in size, shape, and behaviors. Fortunately many members are under 1 1/4 inches (3 cm) so are great for smaller aquariums. Shapes range from round disc-type' fish like the Silver Dollar, elongated fish like the Pencilfish, to the Hatchetfish with a deep bodied 'hatchet' type shape. And behaviors are of all sorts. The Hatchetfish for example, are known to break the surface of the water and "fly" after their prey using their large pectoral fins as "wings"! Characins are found in Central America, South America and Africa. They are considered by some to be the most ancient fishes in the Superorder Ostariophysi. They are members of the Order Characiformes, one of four orders contained in the Ostariophysi superorder. Their three sister orders are the Cyprinids of the Order Cypriniformes containing minnows and allies, the Catfish of the Order Siluriformes, and the Electric Eels and American Knifefish of the Order Gymnotiformes. There are at least 1674 Characin species contained in about 270 genera. The fact that they are in both the Americas and Africa is considered proof that the two global continents were once joined! This means that Characins originated before the land masses split in Mesozoic times, some 80 to 150 million years ago. Currently there are about 1465 species in the Americas and about 209 species in Africa along with many species that are not yet discovered. Characins are a large group of fish with a great diversity in size and shape. They range in size from the tiny Bolivian Pygmy Blue Characin, Xenurobrycon polyancistrus at just over 1/2 inch, 0.67" (1.7 cm) to the gigantic Goliath Tigerfish Hydrocynus goliath at 4 1/3 feet (1.3 m). A few of the larger characins are important as food or game fish. Shapes range from round disc-type' fish like the Silver Dollar, elongated fish like the Pencilfish, to the Hatchetfish wiht a deep bodied 'hatchet' type shape. Taxonomically the Characins used to be contained in a single family, Characidae, under the Characiformes order. But there has been all sorts of systematic and taxonomic changes in recent years. Many species have been separated into their own families, so now there are 18 recognized Characiform families including the Characidae family. Those that remain in the Characidae family, about 776 species, are now more commonly referred to as characids, with the term "characin" still reflecting the entire order of Characiformes. Characins resemble Cyprinids but they have an adipose fin located between the dorsal fin and tail. This fin is small, fleshy, and lacks the rays usually found in the other fins. They are carnivores with teeth in a mouth that is usually not protractile, meaning it is not capable of extending forwards such as on sucker mouth types of fish. The bodies of most species are covered in well-defined scales. Anatomically Characins have the characteristics of each group of their descending taxonomic hierarchy. Characins are members of the Actinopterygii Class of "ray-finned" fishes. They are characterized by having fins that are webs of skin supported by bony or horny spines. As a member of the Subclass Neopterygii, the "new fin" species are distinguished from their ancestors by being able more faster, their scales and skeletons became lighter, and their jaws became more powerful and efficient. As a member of the Infraclass Teleostei, they have modifications to the jaw that allows them to protrude their jaws outwards from the mouth, the upper and lower lobes of the tail fin are about equal in size, and their spine ends at the caudal peduncle. Characins possess a Weber's apparatus, a characteristic of all fish in the Ostariophysi Superorder. This is a series of bony parts that connect the hearing organ with the swim bladder where it operates as a sounding board, thus amplifying sounds. Acestrorhynchus are "needle jaw" fish referred to as Freshwater Barracuda in the aquarium trade. These fish have elongate pike-like bodies and large conical teeth, adapted for predation on other types of fish. They range in size from about 1 1/3 to 15 3/4 inches (35-400 cm) in length. The Characidae family inhabits a wide range and variety of subtropical and tropical habitats. Originally this family contained all the members of the Characiformes order, however many were recently moved to other families. The Serrasalminae contains the Pacu, Piranha, and Silver Dollar. It is currently classified as a subfamily of Characidae. Some place these fish in their own family Serrasalmidae, but the taxonomy and systematics of these fish is very complicated and much remains unsettled. Curimatidae are known as Toothless Characins. They are limnivores or "bio-film grazers" that can reach up to 12.6 inches (32 cm) in length.